Social media isn’t something that existed for your wedding business as recently as seven years ago. It requires time and effort, and making sure it’s at least a small piece of what you do every day is no easy task for a busy wedding professional. Have you ever wondered just how important social media is to the wedding planning process and whether or not it actually affects your bottom line? 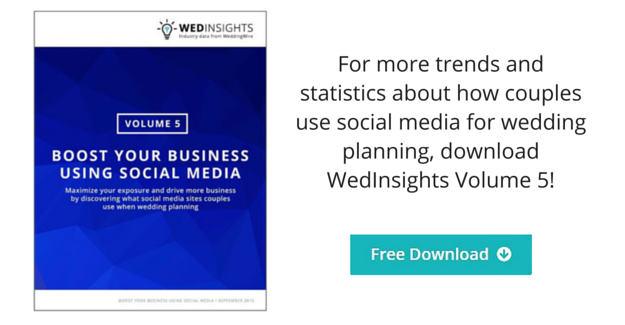 Check out these five statistics from Volume 5 of the WeddingWire WedInsights Series to find out how couples are wedding planning on social media and how you can maximize your business’ presence. There’s no doubt about it: data shows that your target demographic is on social media. Due to the significance of social media during the planning process, not having a social presence on these sites could negatively impact your brand’s reputation. In fact, 62% of couples say that vendors who are not on social media seem “outdated.” If you have not yet created a social presence for your wedding business, now is the time to start. Many social networks have become curated content streams for consumers to keep a pulse on the people, topics, and products they care about. Instead of flipping through magazines, today’s couples are scrolling through online feeds to find vendors for their big day. This is your chance to stand out and wow potential clients with content that appeals to your audience. Try posting examples of your work, aspirational photos, useful advice and tips, or interesting and funny links. If a couple wants to learn more about your business, they’re likely to visit your Storefront or website. But what about those other factors that may not be easily seen through your own marketing materials? Social media allows for a more personal experience and should be a place for your clients to get to know you. Your customers want to work with people they enjoy being around, so show them a little bit of your personality! Social media gives you a direct line to your consumers, and many engaged couples are not being shy about sharing their own stories and experiences with wedding professionals via social media. Use this engagement as an opportunity to listen to what they’re saying and use it for your business. What questions are they asking? What are similar brands posting and talking about? Use this as a way to tailor the conversation and engage more couples. Because couples often engage with social media when they’re multi-tasking, it has become that much more important to post interesting content so that you can capture the short attention span of your prospective clients. But also remember that the point of social media isn’t just posting – it’s interacting! Use your accounts to actively engage with prospective clients and you’ll stand out from the crowd of other professionals constantly pushing out their own marketing messages. « WeddingWire World Speaker Announcement: Shawn Johnson!